When I started this produce box gig, I quickly realized that Wednesday (delivery day) is the day that I have to process everything. Whatever can be frozen gets cooked and/or packaged for freezing that day. We don’t want no blackened basil around here. I also realized what my grandmothers before me had realized: stockpiling nature’s bounty in the freezer will pay off big dividends later. Sure, we could all the corn in one week — until it started coming out our ears. 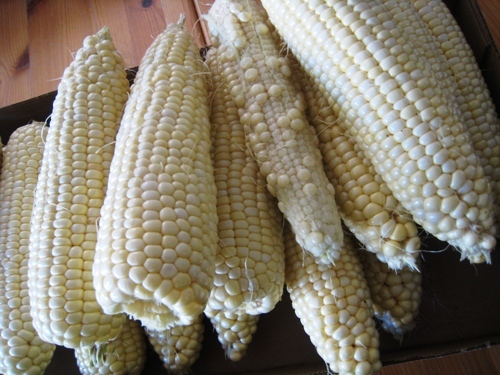 Or I could blanch the ears, cut the kernels off the cob, and serve the corn later when corn wasn’t in season. It’s the same thing I do when I stockpile canned and dry goods that go on sale. So, we’ve got this stash of corn in the freezer and along comes a bundle of fresh thyme. I’ve been waiting for this moment. Thyme is one of my go-to herbs in the spice cupboard. I go through bottles of it every year. And here it is, fresh! Time to bust out some corn from my frozen treasure trove. This is a perfect side dish for upcoming holiday meals. Not only does it use frozen corn, easily available and usually quite sweet, but it also comes together in a flash. You con’t have to have fresh thyme, but I think it makes a great asset to the dish. 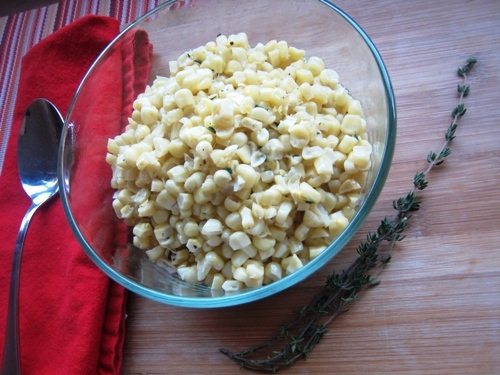 In a large skillet with a lid, combine the corn and a small amount of water. Cook on medium heat, covered, until the corn is hot. Drain off the liquid and add the butter, thyme, salt, and pepper. Cook, stirring until the butter has melted and the seasonings are blended. Thanksgiving-themed What’s On Your Plate: On November 16th, we’ll be sharing our Thanksgiving Menus! If you don’t have one decided by that time, you can be inspired by what others share. Thank you for hosting! I shared my challah recipe this week. I’ve had so many issues in the past making it, but I finally found just the right one. Thanks for hosting! I linked up with some Hoisin BBQ Sauce. It’s good on just about anything! Yes, I also love having summer’s produce in the freezer. Particularly corn,tomatoes, and peppers. Thanks for hosting! @Carrie @ My Favorite Finds, it’s been a wonderful way to use up the produce box without the stress.